I am going to be painting rooms in a home. I have never painted a room before and I just need a brief but complete run down (maybe a checklist) of what I need to buy. Also what do i need to do in terms of prep to make this easy, fast, but also look great? What supplies will I need to paint my room? What paint supplies do i need to buy at my home improvement store? 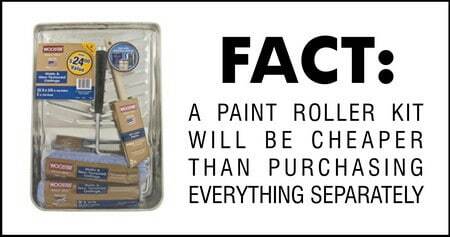 Your local home improvement store will have complete paint kits with quality brushes. Buying a kit is cheaper than buying all of the items separately. A kit will usually include paint rollers, a rolling handle, a metal tray with plastic liners, a screen that fits the tray, and multiple sized 1″ to 2″ paint brushes. Disposable items that may not be in a kit but will still be needed is wooden paint stir sticks, plastic floor sheeting, and blue painters tape. Other items needed for painting that you probably already have would be a paint can opener (flat screwdriver works), and a damp rag. Painting supplies needed will be a sturdy paint tray with disposable liners, paint roller, rollers for paint, extendable roller pole for high areas, painter’s tape, 2″ or 3″ regular painting brush for corners, wooden paint stir sticks, plastic floor sheeting, blue painters tape, and a paint cup with liners. 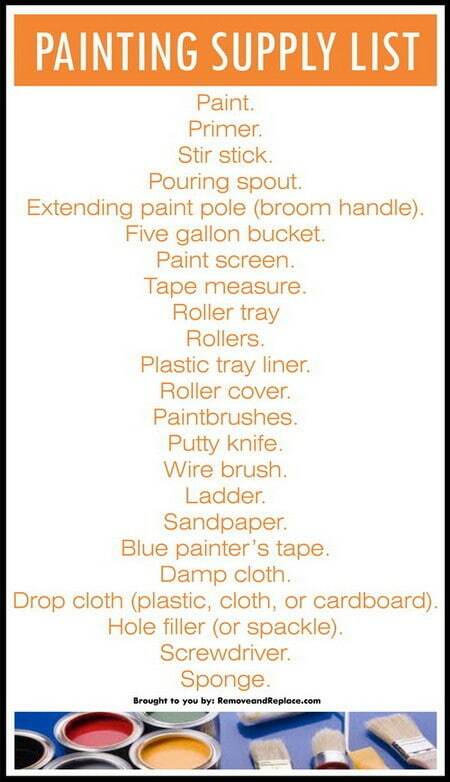 See below for a complete painting supply list. What do I need to do with the walls and floors in preparation (prepping) for painting? For room prepping you will need to prepare the wall surfaces and the flooring area. Each wall should be washed of all dirt, finger marks, and dust, and then left to dry. You can also just wipe the walls down with a damp cloth or sponge if it’s already clean. If there are nail or pin holes in the walls they need to be filled with a light weight spackle or hole filler. The floor needs to be protected with plastic, cardboard or cloth drop cloths to avoid drips on your carpet, tile or wood flooring. Are there any tips or tricks that can help me with painting faster and less messy? Don’t buy an extension pole, use the handle on your broom or mop as the threads are usually the same. Purchase a paint roller for each color you will be using. Cover door knobs with plastic bags as they will probably be touched when painting. Wrap the rollers in saran wrap (or in a large plastic bag) between coats and you’ll never have to wash them. Try not to get ceiling paint on the walls (or wall paint on ceiling) as it will show through and need to be repainted. Always have a damp cloth near you to quickly wipe up any paint drips. Right click and save on the Painting Supply List then save it and print it! Extending paint pole (broom handle). Drop cloth (plastic, cloth, or cardboard). Do you have another painting supply item we need to add to the list above? Please let us know in the comments below and we will add it to the list. I’m thinking about repainting my living room and need some help. I had no idea that I should buy 2″ or 3″ brushes to help me get corners. I’ll have to make sure that I create a list of supplies and need and buy them from a reputable store. Another thing to get is to buy paint that is durable and of a high quality so that it will last a long time. Painting a room can be challenging. 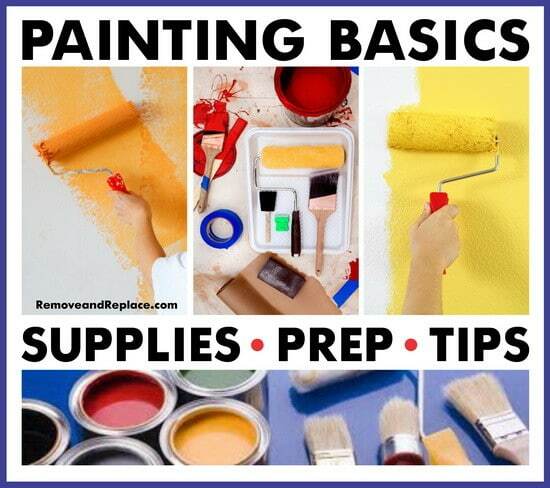 However, if you spend just a little more time preparing before setting paints down, then that usually works best. A tarp and tape are your best friends. Wow this is very impressive. Many thanks for all the info. Previous post: When Is The Best Time To Pin On Pinterest?